The new return date on the article 78 petition will be pushed out a bit past 3/6/2012; at the end of the day, our legal system takes time to navigate. Initially, and naively, I was expecting this action to come to a conclusion in a quick dramatic fashion. That is not going to happen. It will happen in a fair and just manner though. I'm sure of it. 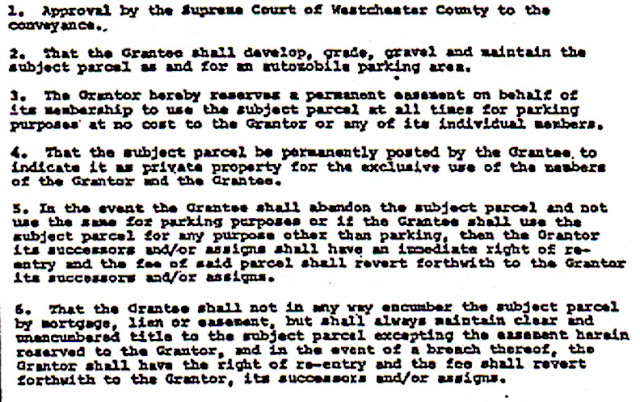 So, in the meantime, I leave you with this: the deed and the restrictions attached to the wetland parking lot. Background: the two lots across Sagamore Ave. from Faith Bible Church used as parking were transferred to the Lakeland Jewish Center from Shrub Oak Lake Estates [an adjacent home owners association] to use for 6 parking spaces. 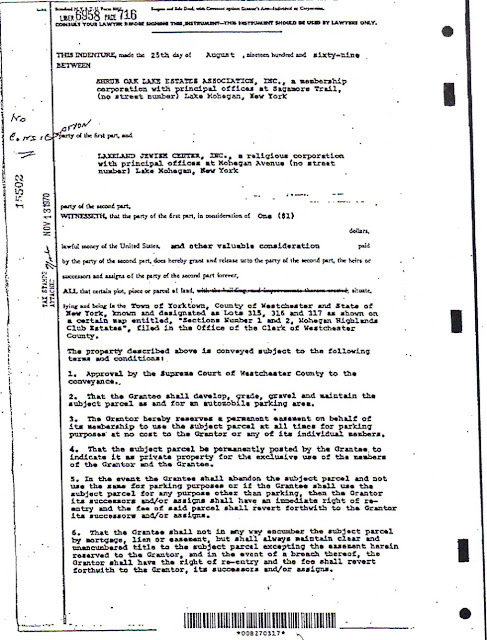 Shrub Oak Lake Estates (SOLE) transferred title to the Lakeland Jewish Center in 1969 and it included six (6) legally binding terms and conditions. It's a bit hard to read, let me enlarge that for you. Still having trouble reading it? Here's a transcription of the six (6) terms and conditions of the wetland deed that Faith Bible Church is legally required to observe. 1. Approval of the Supreme Court of Westchester County to the conveyance. 2. That the Grantee [Lakeland Jewish Center--now Faith Bible Church] shall develop, grade gravel and maintain the subject parcel as and for an automobile parking area. Setting aside the fact that the wetland lot is now paved, they comply with that term. 3. The Grantor [Shrub Oak Lake Estates] hereby reserves a permanent easement on behalf of its membership to use the subject parcel at all times for parking purposes at no cost to the Grantor [SOLE] or any of its individual members of the Grantor and the Grantee [Faith Bible Church]. That speaks for itself [emphasis mine]. 4. That the subject parcel be permanently posted by the Grantee to indicate it as private property for the exclusive use of the members of the Grantor and the Grantee. I like how attorneys use such crisp, clear language. 5. In the event the Grantee shall abandon the subject parcel and not use the same for parking purposes or if the Grantee shall use the subject parcel for any purpose other than parking, then the Grantor its successors, then the Grantor its successors and/or assigns. No can argue FBC does not comply with that condition. 6. 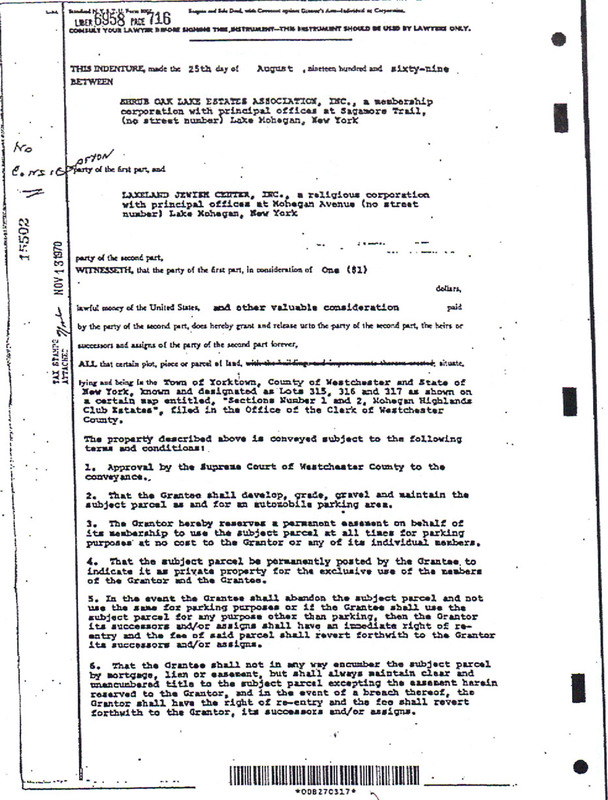 That the Grantee shall not in any way encumber the subject parcel by mortgage, lien or easement, but shall always maintain clear and unencumbered title to the subject parcel excepting the easement herein reserved to the Grantor, and in the event of a breach thereof, the Grantor shall have the right of re-entry and the fee shall revert forthwith to the Grantor, and in the event a breach thereof, the Grantor, its successors and/or assigns. Let's all marinate on that while the paint dries.